Whilst these stunning visuals are purely computer generated, we now know from looking at other first class suites, such as the Jet Airways, Singapore Airlines or Emirates, that the finished product will be almost identical to what you see here. 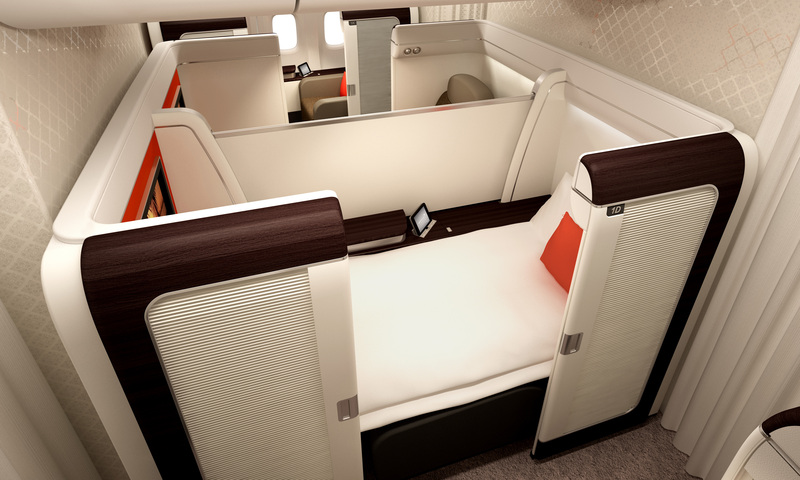 What still isn’t clear is the images show the 1 x 2 x 1 suites in a small intimate cabin that seems to only house 4 suites, yet the press release mentions there will be 8 seats in first class, as does their YouTube video, This leads to the question, are they separating the two rows out in mini cabins? If so, this will be of a great appeal, similar in appeal to ‘Row 5’ on Virgin Australia’s 777 fleet. • Personalized fine-dining cuisine concept with a Chef on-board, ready to present you with an array of diverse delicacies. Enjoy Indonesian regional festival degustation, Japanese Kaiseki or European ala Carte. • In-flight connectivity (GSM & WiFi). Enjoy our complimentary WiFi access. We feel that this firmly places Garuda Indonesia as a carrier of choice for 2013. Their new connecting route on the 777 from London to Sydney now also provides an alternative option for a luxurious way to travel on the still much in demand “Kangaroo” route. With it’s continuing efforts to improve its image, now is the time to experience an airline that seems to understand luxury and what a passenger really wants, whether in economy, business class or first class, and we look forward to travelling with them in the near future, and when we do, expect a full report first here! Maybe they can wrestle away Kangaroo traffic from the Gulf Carriers and SQ. I believe, Garuda is very capable .. given in a fairly short time after the lifting of restrictions on flying over europe skies .. Garuda was awarded in 2013 ranked as the 8th best Airline in the world, ranking 5th in Asia and 2nd best in Southeast Asia after Singapore airline .. Garuda Indonesia has also awarded as the World Best Airline for Economy class (Y-class) products and services.